Astana City Vision is the project for a new facility capable of accommodating up to 30,000 residents, workers and visitors. This project finds its right place in the young and lively capital of Kazakhstan, where urban development is carefully administered especially in anticipation of the upcoming international events in which the city is called to respond such as the EXPO 2017. Conceived and designed with innovative criteria in terms of architecture, engineering, environmental sustainability and technology, this ambitious project has the dual purpose in one hand of tracking the guideline for a more efficient city, and on the other to find a solution to the climatic problem of Astana (which is considered to be the coldest capital in the world with temperatures from -40 in winter to +40 in summer). 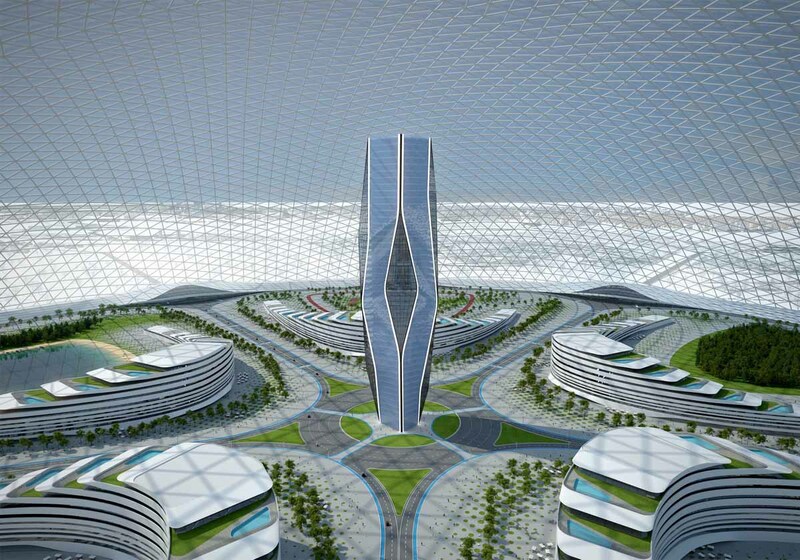 - Astana City Vision as a sustainable city. Astana City Vision leads the way to the idea of the city becoming efficient and functional, becoming the concrete response to the unregulated growth of cities dissipating resources and energy. Access to energy sources directly determines concrete scenarios for social, economic and environmental development. 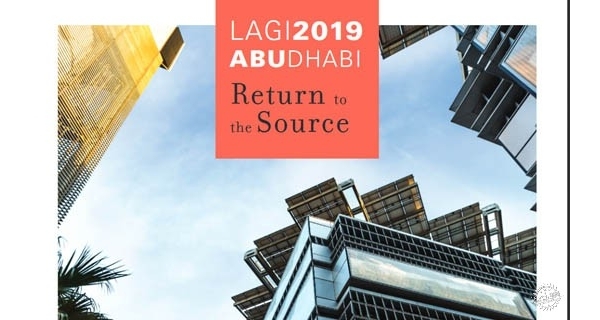 Technological research and scientific advances related to the optimization of the various sources of energy define the functional approaches of societies and lead to an energy-sustainable future. 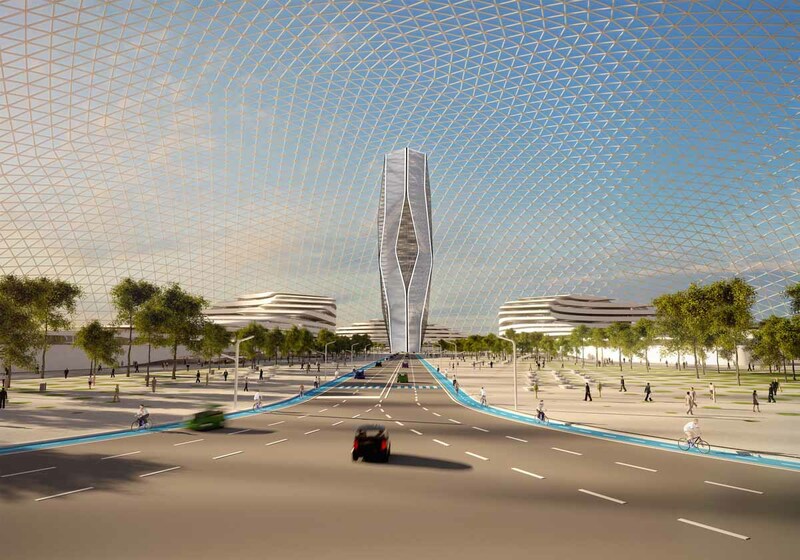 Astana City Vision will be developed on an area of 1.75 sq km in the east of the city of Astana. 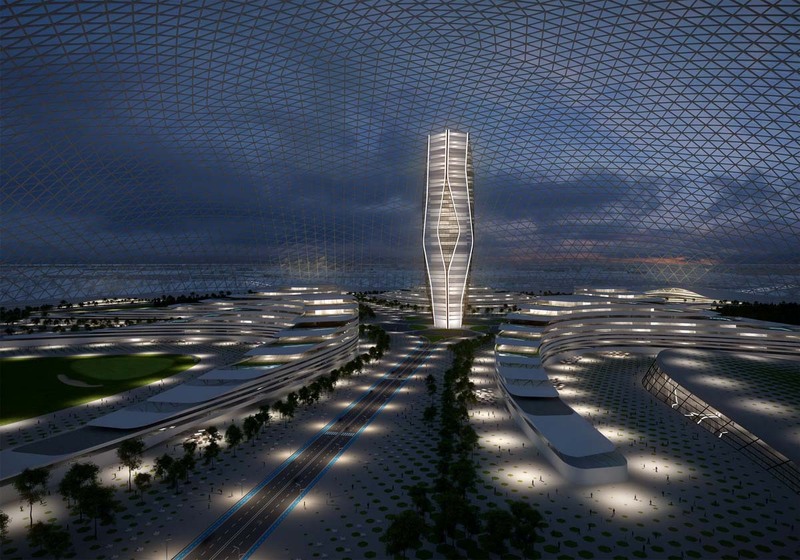 Designed as a settlement projected towards the future, the image we have of this new urban development is not so much of a smart city, but a " Senseable City", capable of functioning as an organism that is able to react to the impulses and to change its technological structure and function according to the needs of the true protagonist of this project: the citizens. 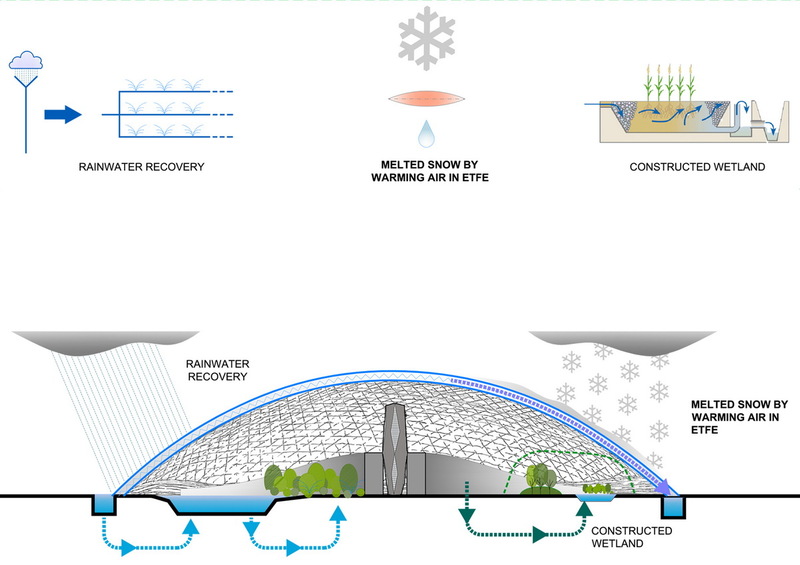 The need to create a large dome (1500 m in diameter and a height of 350 meters) was the first step in order to create a microclimate that can respond to the climatic problem Astana. This geodesic structure gives us the ability to control the climate inside improving the temperature inside in a surprising manner, and at the same time limiting the dissipation of energy resources. The masterplan of the project includes the construction of residential and commercial areas, hotel compounds, office buildings, religius buildings and plus all the traditional functions of a city, as well as creating areas dedicated to the development of economies related to the digital sector, investing heavily in the high-tech industry and the emergence of new start-ups. In this way a totally new economic and industrial system will be developed which will not require the spaces and the infrastructure as traditional industry, that has led to the phenomenon of delocalization of production outside of the cities. The digital industry will bring back the workers to the city, work and production spaces will be redesigned according to these new parameters. And the factories of what many call the third industrial revolution will become from BIG to SMART. The built area will be approx. 2 million square meters, while large spaces will be reserved for green areas and recreational facilities. Mobility within the structure will be permitted only with electric vehicles or bicycles. The five entry gates will be connected with the parking areas where petrol vehicles will be parked by both residents and occasional visitors. These five acceess gates will be the starting point for the five major roads that will lead to the the center of the structure where a 250 square meters skyscraper will stand high. These roads are also connected to each other via a ring road that runs around the perimeter of the dome. They also act as dividers between the five areas where all the buildings will be erected such as the leisure facilities and the green areas. All buildings including the skyscraper are designed as multipurpose facilities with different uses, ranging from residential to administrative and industrial. Astana City Vision is a real social project proposal able to give life to a new urban community, culturally and ecologically sustainable. Astana is surrounded by one of the most extreme habitat in the world. Temperatures are very low in winter and very hot in summer and daily variations are large. 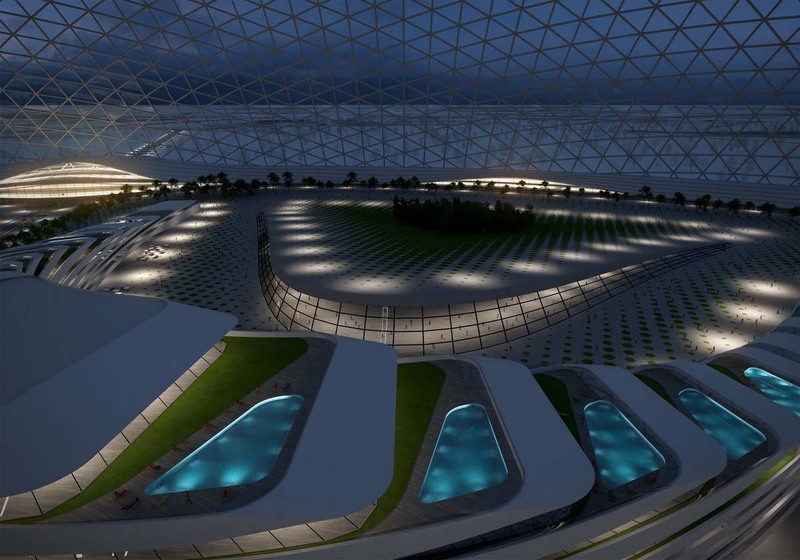 For this reason the project includes the realization of a protected environment enclosed under a transparent Dome. The Dome will be realized using ETFE (Ethylene tetrafluoroethylene) air-filled cushions mounted on a light metal structure. Two protective layers will be realized. The space between the two layers will be used for technical purposes: polluted air extraction, snow melting, water recovery. The structure of the Dome will be a dynamic skin, which will act metamorphosis in order to adapt to the external environment. When the climate is more gentle, some windows will be opened by the Central Management System and the air passage through the skin will be permitted. 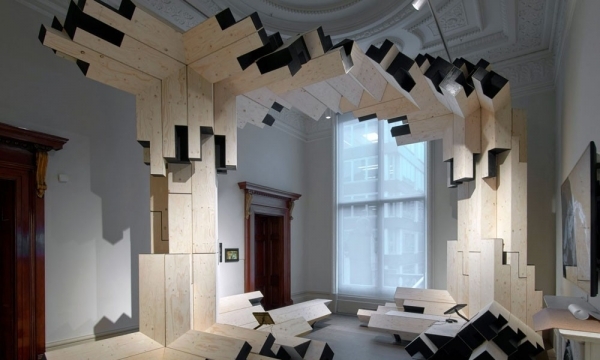 Otherwise, when the climate is far from optimal conditions, the windows will be kept closed and the internal environment will be protected from weather phenomena. When the Dome is closed, air renovation will be provided by underground channels fed by wind cowls installed on the external perimeter. Air movement will be mainly wind-driven. 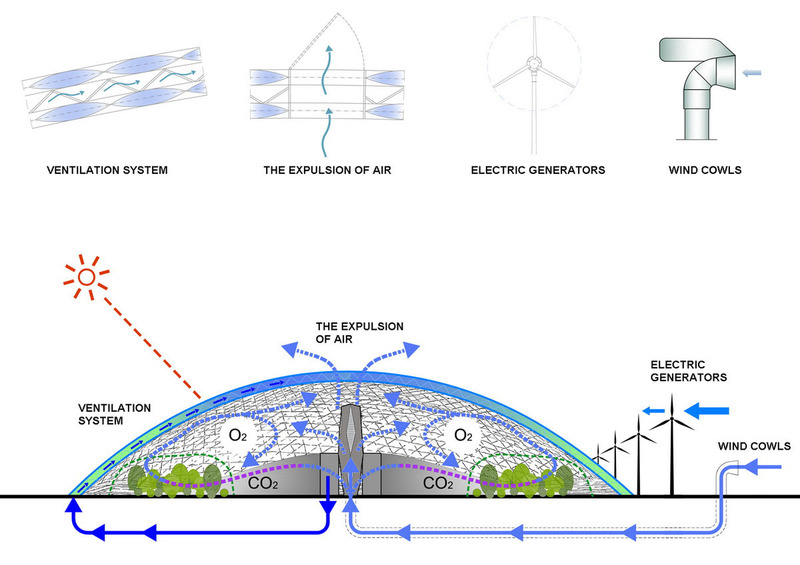 In order to protect the Dome from strong wind and to produce energy, an array of wind turbines will be located upwind the Dome. Like a live organism, the protected environment under the Dome needs to receive fresh water for human consumption, rainwater for irrigation and rejects wastewater. The project will include an integrated water management system. Rainwater will be collected from the covering thanks to pipes installed into the gap between the skin layers and will be channeled to dedicated tanks. The collected water will be used for irrigation and for toilet flushes. Also, rainwater will be treated and will feed the artificial water bodies included in the project. Some green areas will be realized indoor in order to improve air quality and to contribute to waste water treatment. For this purpose, constructed wetlands will be realized under the Dome; wastewater will be pre-treated and then channeled to wetlands for final depuration. The cleaned water produced by the system will be reused for irrigation and for toilet flushes. During winter, possible snow will be melted by blowing warm air in the gap between the skin layers and into cushions. Melted snow will be collected as rainwater. 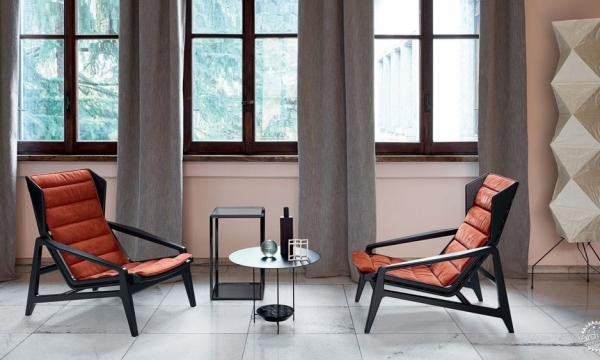 The Sun plays an important role, connecting the indoor and the outdoor environment. 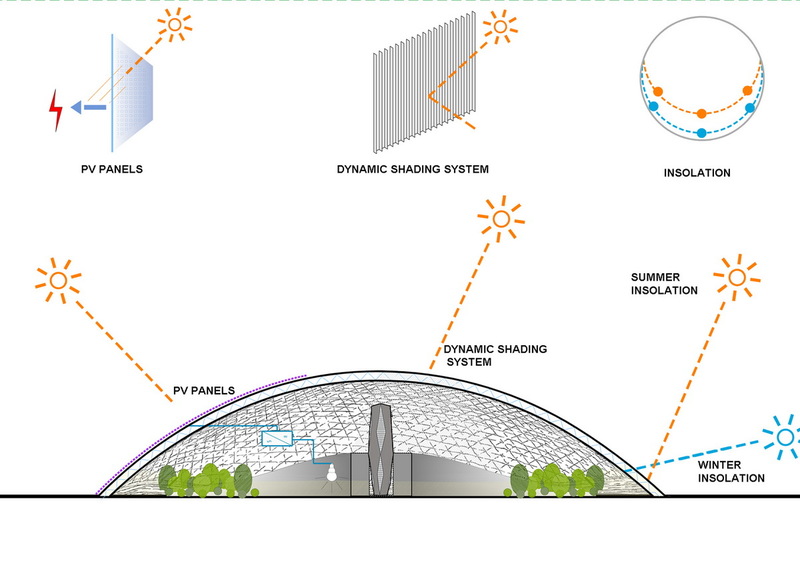 The system will be set in order to maximize of the use of solar gains in winter to save energy and maintain a warm environment under the Dome. During summer, overheating will be avoided by dynamic solar shading devices included into the external skin layer: by varying the air pressure inside the cushions, the solar factor and the light transmission factor will be varied obtaining the desired value. PV cells will be integrated in the external surface of the Dome in order to guarantee energy production from renewable sources. The pattern of PV cells will be studied using simulation tools in order to determine the optimal distribution of transparent cushions and PV elements. The project is characterized by the use innovative technologies that are optimal solutions for specific issues. 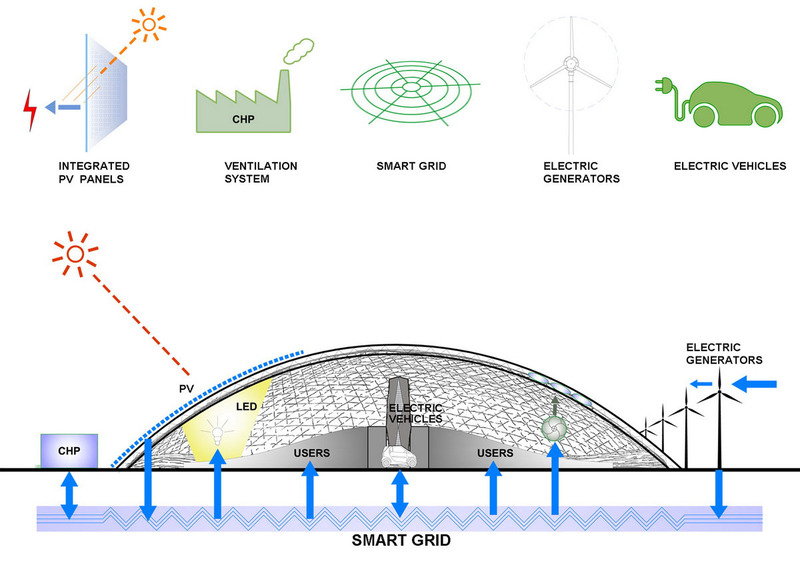 Also, another surplus value is given by the smart grid which will connect all the elements under the Dome and the Dome itself. The smart grid will collect information from all the devices, monitoring the external weather, changing the configuration of the protective skin and managing all energy uses inside the buildings. Under the Dome, only electrical vehicles will be admitted and charging stations will be provided in focal points. Electrical vehicles will be used also as temporary storages for electricity in order to maximize the use of renewable sources by changing the load profile as needed. Energy saving measures(like LED lighting equipment) will be applied to all buildings and to common spaces. 项目组：Simone Luciani, Yana Ivanova, Jonathan Arbib, Annapina Di Filippo. Project team : Simone Luciani, Yana Ivanova, Jonathan Arbib, Annapina Di Filippo.